The Lancia-Ansaldo 1ZM armored car is possibly one of the most distinctive vehicles ever made, courtesy of the highly unusual miniature one-man turret on top of the wide main turret. Design work on a new armored car for the Italian Army had begun before the First World War, as the vehicles in hand were either worn out or obsolete. The design for the 1ZM was based on the successful Lancia 1Z truck chassis but refitted with an armored body by the firm of Ansaldo. The first orders for these vehicles was placed by the Army in April 1915. Development continued during the production of further orders with the top turret being eliminated in the 3rd Series. The 1ZM saw action right from the start being deployed almost as soon as they arrived with the Army in 1915. They would go on to see active service from the Balkans to North Africa during and after WW1 and well into the interwar period. ​The development of the Pavesi Autocarro Taglifili (wire cutting machine by Pavesi) began in 1915 and is an unusual machine. Built not on tracks but a type of patented wheel with feet, sometimes referred to contemporarily as a ‘track-laying wheel’. 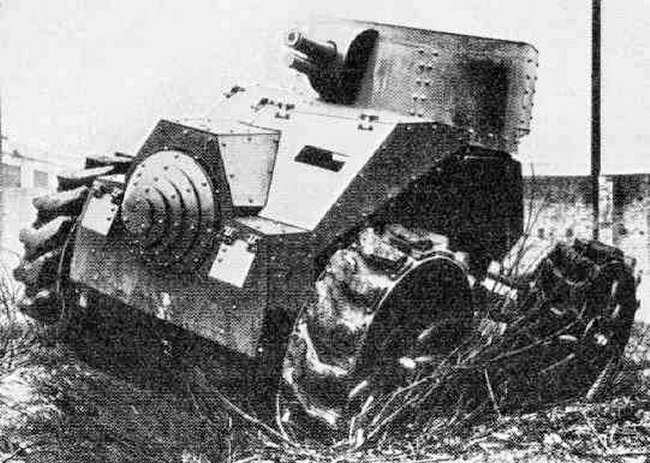 The machine was based on the Army’s 5 tonne Pavesi tractors but with a large armored body fitted to it. Initially, it was fitted with just a single, open-topped turret. On the front of the machine were two large vertical wire cutting blades powered by the engine which, when tested, effectively cut through a thick fence of barbed wire. The Autoblinda 41 (named after its first year of production, 1941) was a further development of the machine gun armed AB 40. Made with an all-riveted construction, the AB 41 had four-wheel drive and a four wheel steering system that proved troublesome. The spare wheels fitted to its sides were free to rotate, thus helping the vehicle over rough terrain and allowing it to drive over higher obstacles.